When we first started thinking about doing the whole "getting married" thing, we were in complete agreement about at least one aspect ... planning our marriage was way more important than planning our wedding. So we decided to think outside-the-box a little, to think about what would really be important to us down the line and then plan our merge accordingly. Near the top of the list, of course, was our families ... we both come from pretty close-knit homes, with deep histories and lots of siblings and a huge value on quality time. So we decided to invest first in that, giving both of our immediate fams a chance to spend some significant time getting to know each other in a fun and relaxed setting. And what a better setting could there be than the beach! So we started hunting around, looking for a place within driving distance of Akron, Ashland, Cincinnati, Columbus, Indianapolis, Princeton, and Washington D.C. (yep, our families are spread out) that was big enough to comfortably hold 28 people (and yep, there are a lot of us). 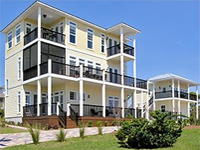 We found the perfect place in Destin, Florida called Forever Views (you can see some photos of it on this PDF). We're pumped about spending a week there this winter, swimming in the pool, eating some great meals together, walking along the beach, and playing tons of board games. It's gonna rock our socks off! Then on Saturday, 1/1/11 (a date that the math teacher in Kristen loves), we'll be putting together a little homegrown wedding on the beach. We've already got a preacher, caterer, florist, wedding party, and plenty of helping hands in our family ... so it'll hopefully be a relaxed and memorable chance to enjoy our "blessed union of souls". And we've found a fantastic local photographer, Mari, to capture it all! So although we're really focusing our wedding efforts on our immediate family, if you're interested in dropping by that Saturday to be a part of our ceremony, just let us know. Or, if you'd like to hear our vows in the midwest instead, we'll be repeating them (and doing a bunch of other fun stuff) at our reception in Cincinnati two weeks later. And if nothing else, you should at least jump online, right here, in mid-to-late January to see all of our photos! Regardless, we're pumped about life together and so blessed to have the opportunity to serve each other for a lifetime. Here we go!